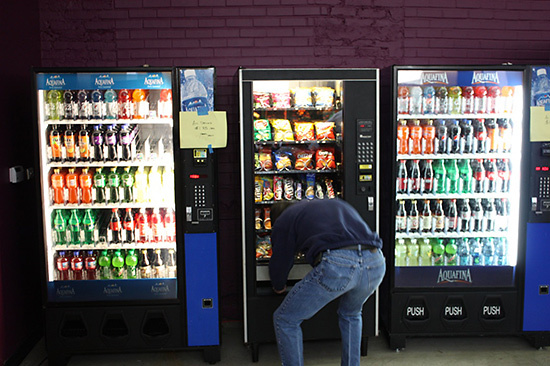 Location: PAPA World Headquarters, 100 Keystone Dr., Scott Township, Carnegie, PA 15106, USA. Pittsburgh once was an affluent mining city. 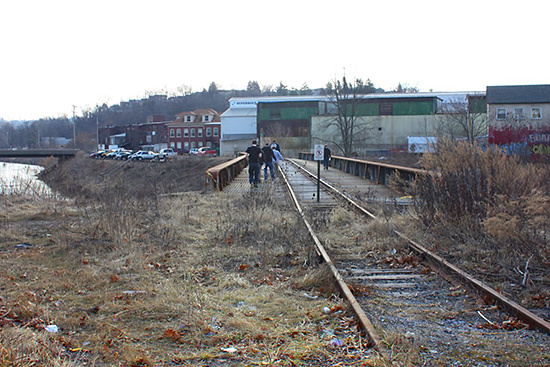 The iron and steel industries developed rapidly after 1830 and became one of the dominant factors in industrial America by the 1860s, giving Pittsburgh its nickname of The Steel City. Today that has all gone. 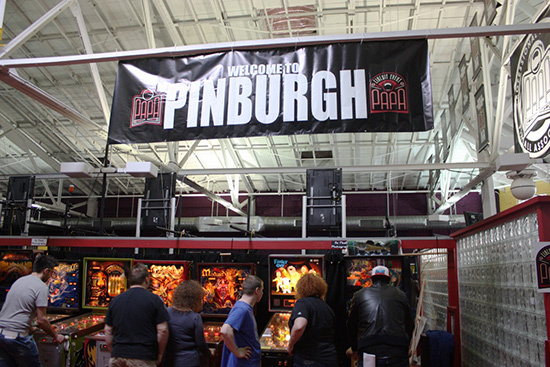 and Pittsburgh now hosts the biggest pinball tournament in the world. 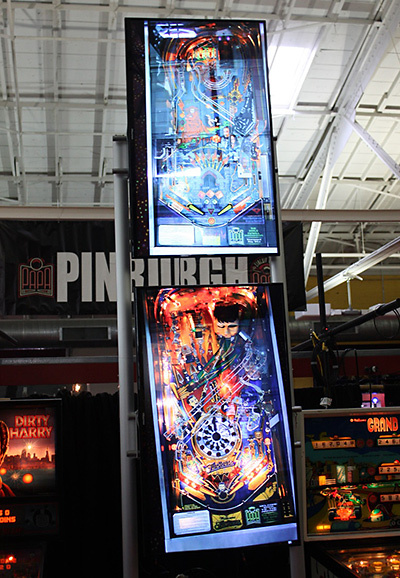 PINBURGH! This is my personal mini-review for people who may not be familiar with the Pinburgh event. 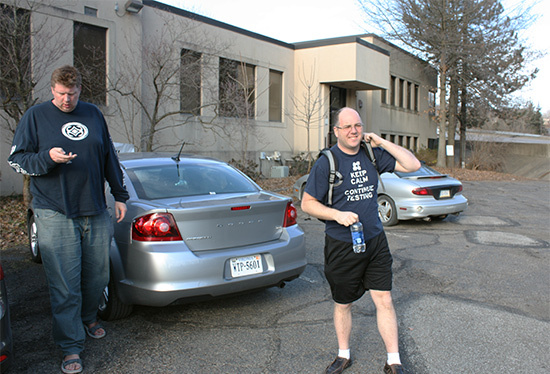 On Friday morning we parked the car in the allocated space near the Pinburgh facility. From the car we come to our first obstacle - a disused railway track. Bowen Kerins advised us not to use it as it has a “No Trespassing" sign on it. So we decide to walk around via the freeway. Some other people have different ideas. This way to Pinburgh, or not! Is this Pinburgh? Oops, wrong building! 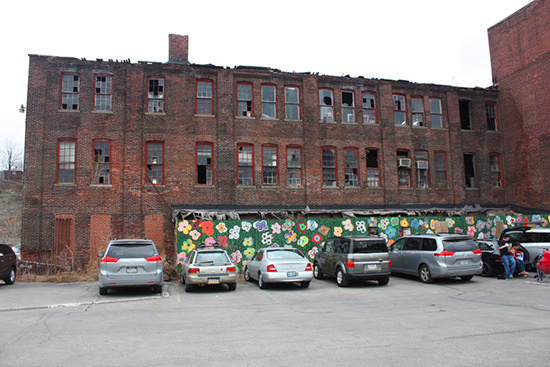 This is a derelict building sitting next door to Pinburgh H.Q. Just another victim of the collapse of the mining industry. 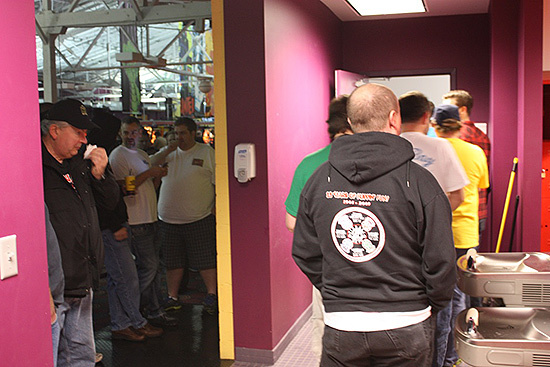 Everyone gathered outside eagerly anticipating the opening of the doors at 9am sharp. 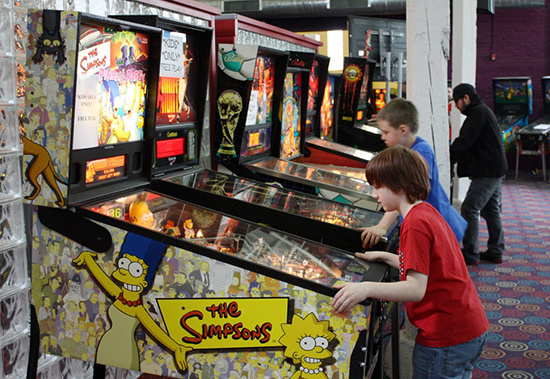 The practice games and the real tournament games all had to be paid for. 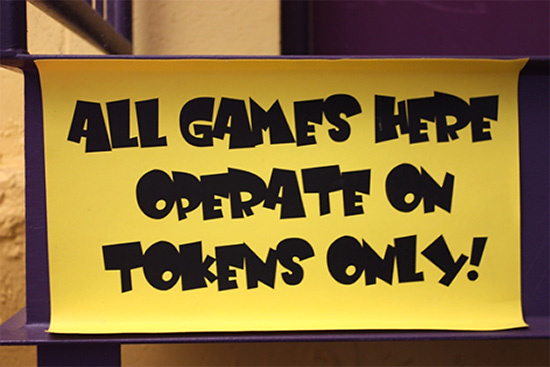 Older type EM machines were 1 token per game. 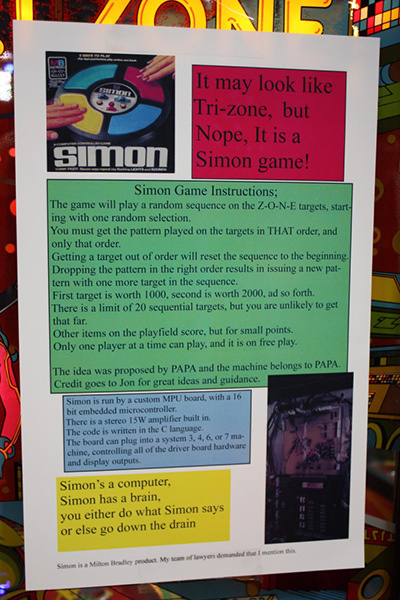 Solid-states were 2 tokens, and newer DMD machines cost from 2 tokens up, depending on age and rarity. The 4 tokens needed for the new Mustang from Stern made it the costliest. 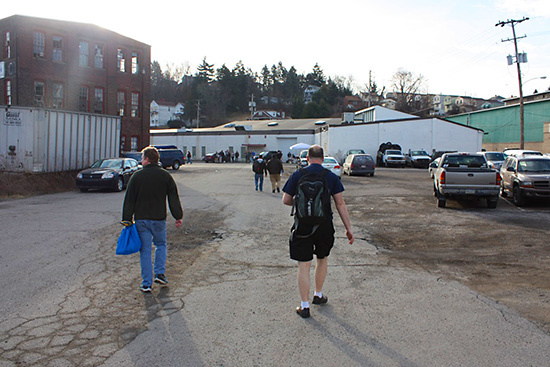 Registration for Pinburgh was limited at 400 places, cost $175 a pop, and sold out in a matter of hours. 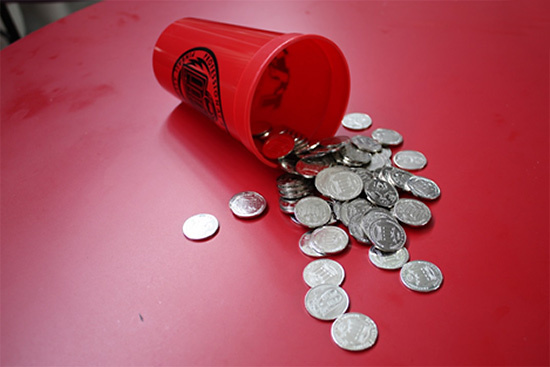 When registering you could also pre-order tokens which came in a PAPA-branded cup. The first side tournament was Simon, which was played on a Williams Tri Zone and was running from 9am to 11pm on the Friday. Player had just 1 ball to try and create the best score. The targets were random and had to be taken down in the right order to bump up the score. 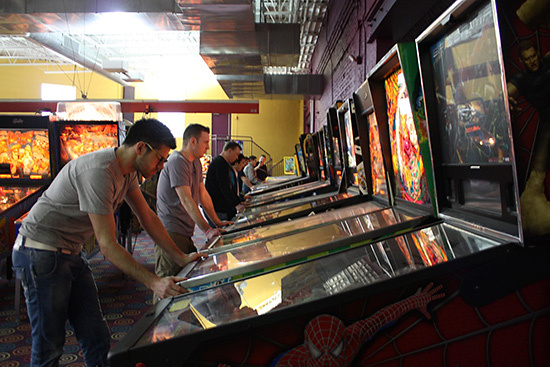 The main tournament on Friday consisted of everyone playing five sets of games - three in the morning/afternoon, then a dinner break, and then the final two sets in the evening. 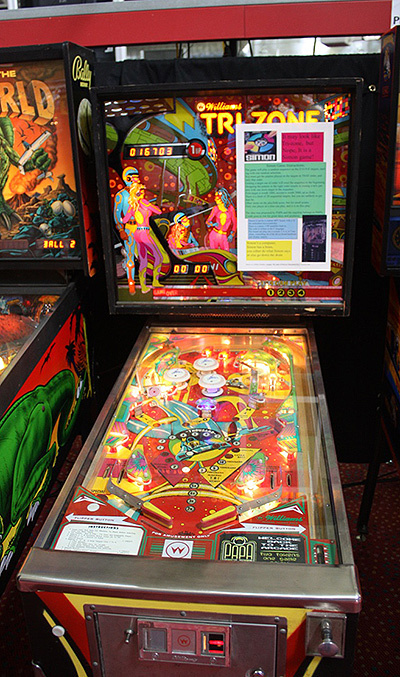 Each set consisted of four players and four machines which were a mix of EM, solid-state, alphanumeric, and DMDs. 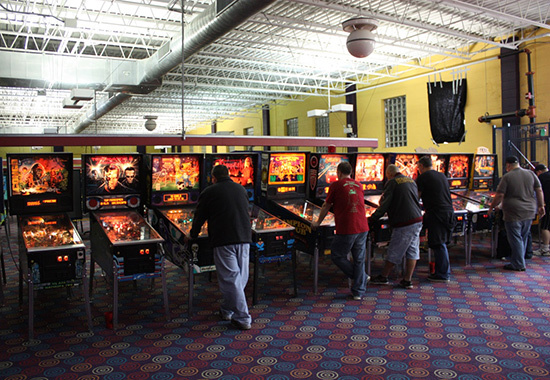 A four-player game was started on each machine and the winner received 3 points. Second place scored 2 points, third place 1 point, and a big zero for fourth position. All points were totalled at the end of the day to determine which division you would be put in when play resumed the following day. They consisted of divisions A, B, C & D, with the A Division containing the best players. Saturday morning arrived and we were given our assigned divisions. We played again using the same format. With 'A' and 'B' divisions carrying over their points from the day before. Meanwhile, the 'C' and 'D' divisions had their slates (i.e. points) wiped clean. The top 24 from each of the four divisions would qualify for the finals to be played on Sunday. 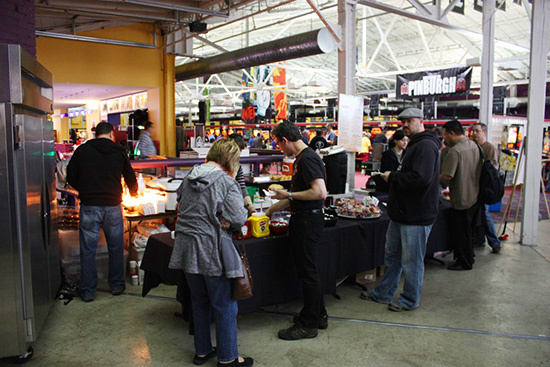 During most of the day the canteen inside served food with some interesting items on the menu. 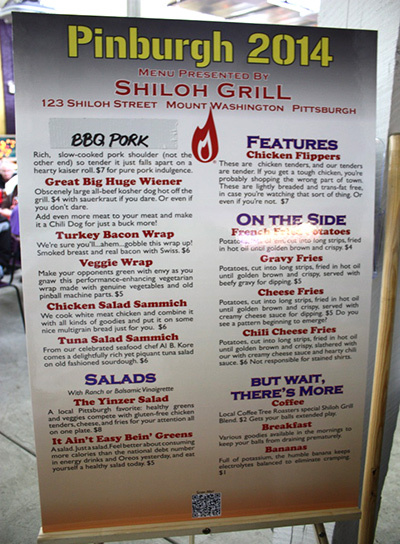 Overall the food was reasonably priced, and I enjoyed everything that I ordered even though the portion size was huge. Friday's dinner break was fun as a lot of people started a street BBQ outside. I was lucky to meet a few local guys and was invited to join them for hotdogs and beef steak wrapped in tortilla wraps. The event was extremely well-organized and didn’t miss a beat all weekend. The queue as seen above for the toilet was sometimes over a hundred people long. 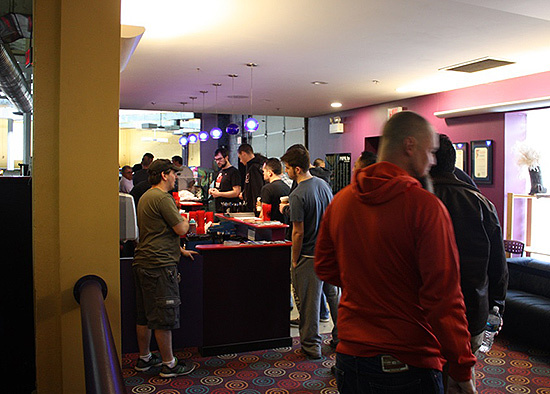 These long queues usually appeared just before the next set of games. The girls this time had the last laugh with their toilet being unusually empty during the weekend (apparently!). 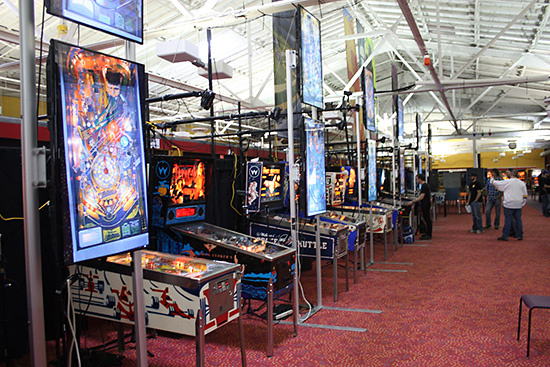 The youngsters were kept entertained with a kids-only pinball area where the machines were all put on free play during the weekend, which was a nice touch. People friendliness was the highlight for me. 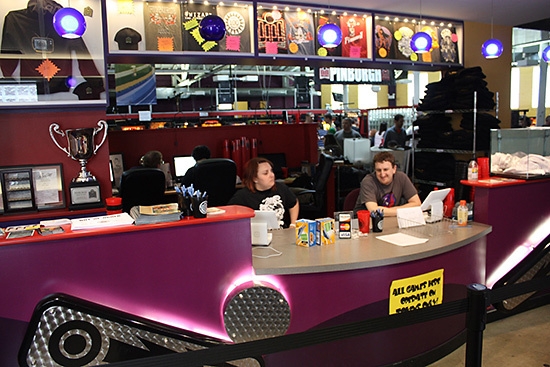 Everybody was extremely polite and went out their way to help you in any way needed. 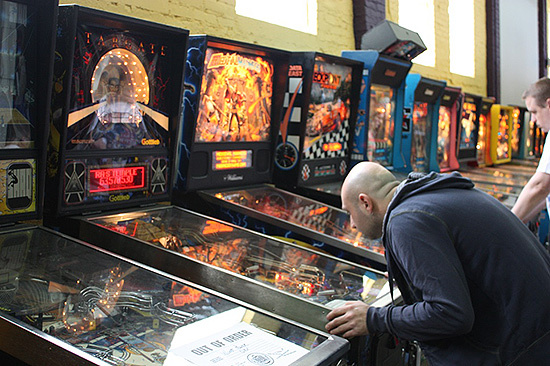 People checked after playing a machine to see if there was someone waiting behind them. Everyone made good conversation and always introduced themselves to you. 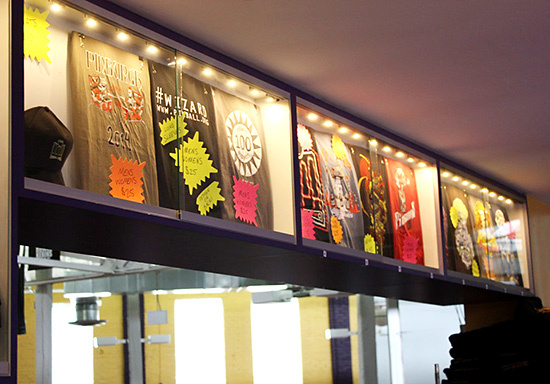 You could also top up your tokens here, or run to one of many token vending machines around the facility. 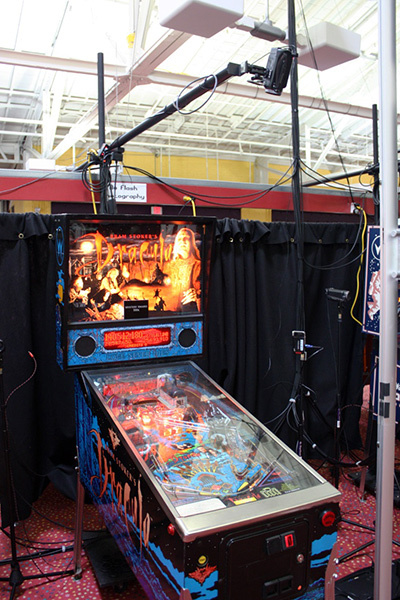 Each machine had its own cameras and was broadcasted live on PAPA TV and Twitch TV during the course of Sunday finals. Here's a video I shot, looking around the PAPA facility. Pinburgh was a very enjoyable and well-run event. I highly recommend anyone to go - you won’t regret it! The only negative was the toilet queue. Would I go again next year? You bet! I am already making plans to book it with a one week stay-over beforehand with some friends I made this year along the way. Sunday night, after the finals had finished, all the lights were turned off and the glow sticks made an entrance in large numbers, with people trying to be creative and making some crazy designs around their legs, arms and necks. This was party night with a knockout-style competition where each player had two lives. We partied and then we partied some more!